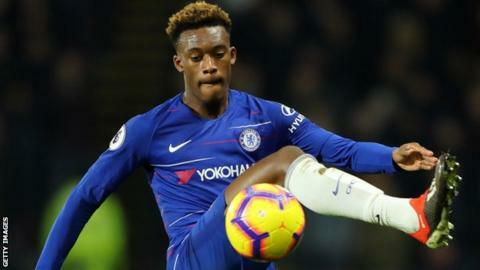 German champions Bayern Munich are “very interested” in Chelsea’s teenage winger Callum Hudson-Odoi, says Blues assistant manager Gianfranco Zola. The 18-year-old, who won the Under-17 World Cup with England in 2017, made his Chelsea debut in January 2018 but has only played six times this season. “We’ve proposed a contract for quite a while, so we’re waiting,” said Zola. Hudson-Odoi joined Chelsea in 2007 and was part of the club’s FA Youth Cup winning side in 2016-17 and 2017-18. One of his six outings this season saw him score his first goal for the Blues in a 4-0 Europa League win over Greek side PAOK Salonika in November. Manager Maurizio Sarri has said he wants Hudson-Odoi to “improve” and thinks the teenager can become “a very important player” for “English” and “European football”. Chelsea have reportedly rejected a £20m offer from Bayern for his services and Zola says he has moved to assure Hudson-Odoi that time spent on the fringes of the first team is “not a waste of time” but “a time you can get better”. “I know he hasn’t played probably as much as he wanted but this is down to the quality of the players in front of him,” added Zola, 52. Hudson-Odoi is fit again following a hamstring injury and could feature when the FA Cup holders meeting Nottingham Forest in the third round at Stamford Bridge on Saturday.